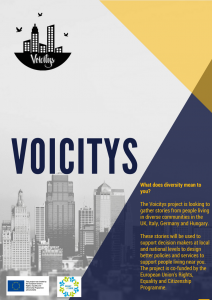 VOICITYS aims to improve social integration through reinforcing social dialogue and communication in European urban neighbourhoods characterised by ethnical and cultural diversity. 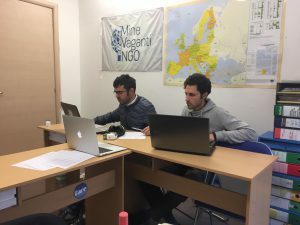 The Consortium is coordinated by Comparative Research Network (Germany), Mine Vaganti NGO (Italy), PVM (UK) and CERSHAS (Hungary). More particularly, we intend to improve and make sustainable the communication and interaction between different social groups, and to deepen dialogue between policy makers, stakeholders and citizens in order to promote more efficient management of diversity. Comparing the positive and negative experiences of local citizens with those of local stakeholders, leaders and decision-makers will improve common understandings of diversity at the neighbourhood level. It will also encourage new approaches to existing policies, incentives and tools regarding social integration and sustainable diversity. The project focuses on studying four diverse European neighbourhoods: Wedding (Berlin, Germany), Jozsefvaros (Budapest, Hungary)., Salford (Greater area of Manchester, United Kingdom) and Sassari’s Old Town (Sassari, Italy). Community Reporting is a storytelling movement that supports people to tell their own stories, in their own ways. 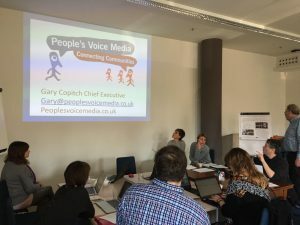 As part of this movement, people’s authentic stories are connected with decision makers who can use the insights in them to make positive change for communities. At the Voicitys Kick-Off meeting 10 trainers from across the participating countries and organisations were trained as Insight Advocate Trainers and equipped with the skills to deliver Community Reporting for Insight programmes that seek to gather lived experience stories of what life is like in diverse neighbourhoods across Europe. With these skills, the Insight Advocate Trainers have been delivering 2-Day training programmes in Sassari, Salford, Budapest and Berlin in which participants will use Community Reporting storytelling practices and smartphones and/or tablets to record their own and other people’s stories in relation to diversity and life in the neighbourhoods in which they live. The Trainers are also holding local meet-up sessions to help their Community Reporters to continue to develop their skills and gather more stories from different people who live in their neighbourhoods. They have begun to share them online. 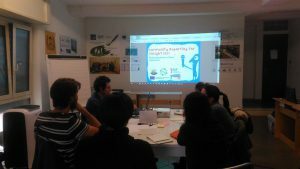 So far over 40 stories have been gathered and over 50 participants trained in Community Reporting storytelling methods. All of the participants are now Silver members of the Institute of Community Reporters. 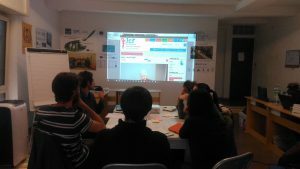 Collecting and curating stories of citizens through Community Reporting. In this frame a total 80 Citizen stories were collected across all partner countries by the Community Reporters trainedby each partner organization. Collecting and analysing stakeholders’ interviews through the implementation of semi-structured interviews. A total 45 interviews with stakeholders at the local, regional, national and European levels were performed by all partner organizations. 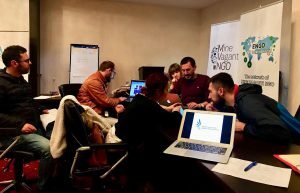 Comparing the results of the two methods and elaborating a series of policy recommendations through participative workshops and consensus meetings in all partner countries. 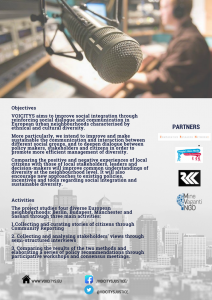 The expected result is to collect and compare information on local diversity from citizens and stakeholders with a view to outlining multilevel recommendations, In doing so, the Consortium set itself the objective of developing a new model of Citizen participation in local and European policies related to diversity. Justice programme contributes to the further development of a European area of justice based on mutual recognition and mutual trust. It promotes: judicial cooperation in civil matters, including civil and commercial matters, insolvencies, family matters and successions, etc. judicial cooperation in criminal matters judicial training, including language training on legal terminology, with a view to fostering a common legal and judicial culture effective access to justice in Europe, including rights of victims of crime and procedural rights in criminal proceedings initiatives in the field of drugs policy (judicial cooperation and crime prevention aspects). 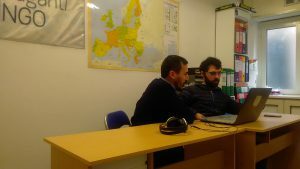 MVNGO implemented a Training for Community Reporters in Sassari. 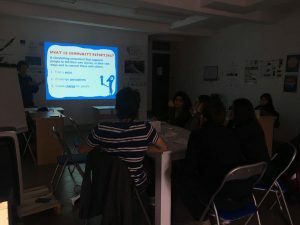 Community Reporters gathered in MVNGO’s office for the purposes of attending 4 Meetups wherein to prepare community interviews. 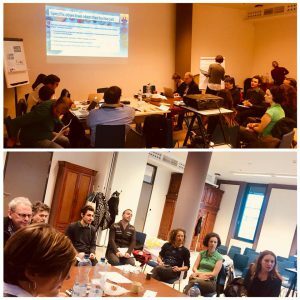 MVNGO is presently working on the preparation of a project proposal in the frame of the upcoming Horizon 2020 Call “Open schooling and collaboration on science education” (Deadline: November 7th 2019) as head of a Consortium of international partner organizations. The main focus of the call is the creation of new partnerships in local communities to foster improved science education for all the citizens. Eligible project proposals comprise actions based on collaboration between formal, non-formal and informal science education providers, enterprises and civil society aimed at integrating the concept of open schooling (across the levels wherein school education spans) in science education. For the purposes of the present Call, “open schooling” is considered as the settings wherein schools, in cooperation with other stakeholders act as agents of community well-being, families are encouraged to become active parteners in school life/activities as well as professionals from business/civil society (including NGOs) are involved in bringing real-life rojects to the classroom. The propoposal presently under development by MVNGO focuses on Citizen Science as a participatory approach to green issues and education.